Marco van Basten played from 1987 until 1995 abroad. His complete foreign career was at AC Milan were he became one of the pillars in their successful period. 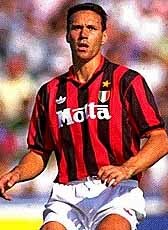 In 1993 Van Basten suffered a heavy ankle injury. After two years trying to recover he gave up and retired from professional football. In 2004 he became national team coach of The Netherlands and was their coach at the Worldcup 2006 and the EC 2008. In December 2007 after many critics he expressed his decision to quit as national coach after the EC. The quarter final against Russia in June 2008 was his final match as national coach. Already in February 2008 the Ajax directors announced the signing of Van Basten after the EC. After a string of bad results he broke up with the club in May 2009 and is since then not active anymore as coach in professional football.